Haru soon confines in the help of two cats from the ‘Cat Bureau’ are of assistance. There is the grumpy fat cat – Muta and the robin hood/Zorro type hero – Baron. They agree to assist her and help her find away out of this contract. Review: Hiroyuki Morita proves that you don’t need to be Hayao Miyazaki to create a Ghilbi Classic. The Cats Return was originally planned to be a 20 minute animation about cats for a theme park in Japan, this soon led to the movie achieving a ‘straight-to-video’ release, but producer Toshio Suzuki was so impressed with the movie they urged it to get a full cinema release. I find myself watching more and more anime nowadays (okay I’ve seen a total of 3), I find myself enjoying them dubbed. Now I find the dubbing from old Hong Kong kung fu movies far different from the Japanese anime, actual decent actors supply their talents to dub other these animated master pieces. For Example with this movie we got to hear the vocal talents of; Peter Boyle (Everybody Loves Raymond & Taxi Driver), Elliott Gould (Oceans 11 & 12), Tim Curry (Home Alone 2 & Charlie’s Angels). Characters that are both played by Boyle and Gould are constantly bickering which always brings tears to my eyes. 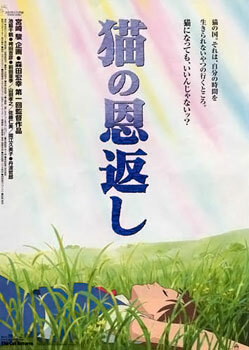 When researching this movie I should have really watched the Sutdio Ghibli’s ‘Whispers from the Heart’ before, this movie features both characters Muta, under the title ‘Moon’ and a small figurine Cat called Baron (You see the Baron in both films was created and given a soul – that makes him come ‘to life’, where as Muta he is just a real life fat cat!). This film has plenty of ‘lol’ moments, ‘lol’ is a short internet term for Laughing Out Loud, I’m pretty sure all of our younger reads would know that. Some of the scene’s that had my side’s slitting is when Haru, Baron & Muta are trying to escape a maze, but the King Cat is tricking them by having other cats hold up fake walls to block their paths, Baron figure’s out the King’s plan and kicks down the fake walls, the wall falls landing against the wall opposite. The funny part is that the wall he falls against is another fake wall, so that falls, which lands onto another fake wall, to cut a long story short we get to see a rather amusing Cat/Fake Wall/Domino sequence. Final thoughts, this is a great movie, you’ll get a real laugh out it, a must own for all Cat Lovers! !